Tilly - Our Newest Cutest Addition To Our Family! How cute is this face...? We have had Tilly for 3 days now and she is 13 weeks old. We got her from our local Dogs Home after she was surrendered from a previous owner who couldn't look after her properly. She's absolutely gorgeous and fantastic with 2 of our children aged 8 and 2. Unfortunately, our 6-year-old daughter is very scared of dogs and we don't know why. We decided on a puppy in the hope that one day our daughter would see that not all dogs jump and bite like she thinks they do. I know that maybe our daughter will never be a dog lover but that she will come to accept that dogs are part of peoples lives and she will be able to tolerate having them around. She has come a long way in the past 3 days from crying when she saw a dog to now being able to be in the same room as Tilly and will even pat her if I am holding the puppy. Tilly has been a pleasure and so gentle, no biting and hardly jumps up on the kids and loves sitting on their laps for a cuddle and a little sleep. It may have only been 3 days since we got her but already we can see she will be a loving member of our family and we are so pleased that she has come into our lives. 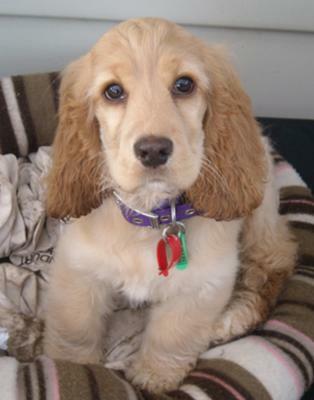 PS: They told us she was a cross with a Beagle but she looks Cocker Spaniel, however she has wide broad feet. Does this mean she will be bigger than average for her size? I don't think you could have a better mix - a cocker and a beagle. Tilly certainly has a beautiful looking face - she's gorgeous! Her big paws are probably from her Cocker genes rather than the Beagle influence. It's nice to hear that your daughter is getting over her 'fear' of dogs. I think Tilly is all the more beautiful for being crossed with a Beagle! Look at those lovely legs and paws and such a cute-looking face. I don't think you'll need to worry about her getting too big.